President Obama attended the House Republican Retreat in Baltimore, and took questions from some Republican House members in attendance. The Republican Retreat is an annual event where the Republican Caucus meets to plan their Congressional agenda for the year. Since this year's Retreat occurred shortly after the State of the Union address, most of the questions responded to Pres. Obama's comments during that speech. Barack Obama: Recovery Act averted a second Great Depression. Barack Obama: Appoint bipartisan fiscal commission and re-establish PAYGO. Barack Obama: Across-the-board tax cuts wouldn't stimulate economy. Barack Obama: Increased spending comes from Bush's automatic stabilizers. Barack Obama: Spending freeze now would be destimulative; later is better. Barack Obama: Some earmarks are defensible, if done in full light of day. Barack Obama: We inherited $8T of debt; and only added $1T more. Jason Chaffetz: No earmarks in any bills. Jeb Hensarling: Spending 40% of GDP on government causes unconscionable debt. Mike Pence: Across-the-board tax relief stimulates broad-based growth. Paul Ryan: Automatic stabilizer spending is mandatory spending. Paul Ryan: Freeze spending now, rather than in future budget. Barack Obama: Big promoter of clean coal technology & nukes. Shelley Moore Capito: Cap-and-trade plus aggressive EPA are job-killing. Barack Obama: Enforce trade being reciprocal; not just a one-way street. Peter Roskam: Free Trade Agreements are no-cost job creation. Barack Obama: Would love line-item veto, but start with earmark reform. Barack Obama: Only a few waivers on lobbyists in senior positions. Jason Chaffetz: Disallow lobbyists in senior administration positions. Paul Ryan: Create a constitutional version of the line-item veto. Russell Feingold: Create a constitutional version of the line-item veto. Barack Obama: High-risk pool for uninsured, now in plan, was GOP idea. Barack Obama: Healthcare debate mostly televised, but could have had more. Barack Obama: Cross-state-line insurance leads to cherry-picking. Barack Obama: Ideas and solutions must pass some test of realism. Barack Obama: Tort reform only saves $5B per year; not enough to matter. Barack Obama: Medicare is major driver of our long-term liabilities. Jason Chaffetz: Healthcare debate should all be televised, as promised. Marsha Blackburn: Reform by reducing bureaucracy and reducing costs. Paul Ryan: Medicare is a $38 trillion unfunded liability--add vouchers. Tom Price: Republicans have offered ideas and solutions on healthcare. Tom Price: Address lawsuit abuse; it doesn't raise taxes by a penny. Barack Obama: Recession job losses more severe than anticipated. Mike Pence: $700B stimulus did not deliver promised employment. Barack Obama: Loyal opposition is not just valuable, but a necessity. Barack Obama: No across-the-board tax cuts for the wealthy. Mike Pence: Across-the-board tax relief better than stimulus bill. 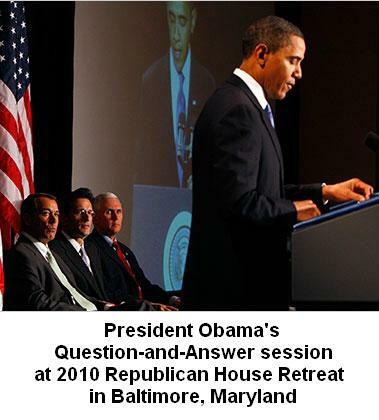 The above quotations are from Obama Q+A at the 2010 House Republican retreat.